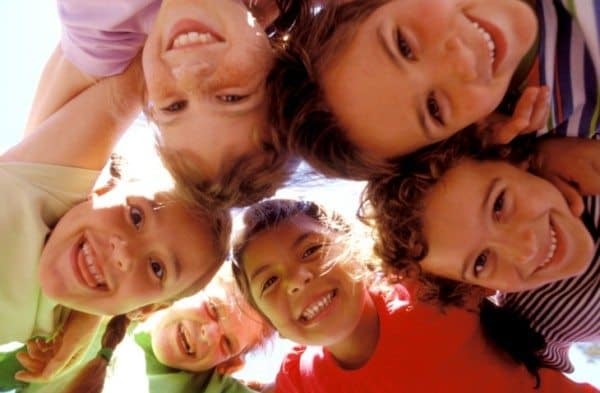 I have a vision of ten years from now, when my daughter is in junior high, that I’ll know her good friends from school and I’ll know those friends’ parents as well, and we’ll get together and be happy about this group of girls and boys who have been close-knit friends since kindergarten. It’s more like a wish, but I can’t help but try to plan and find ways to support that happening. I think about it when I’m washing dishes; I make plans to invite other parents over to my house so we can know each other and be a part of our children’s growing good friendships. It would also be good for developing friendships of our own. My family moved to our city a few months ago, and we’ve been making friends in the neighborhood. I stop after school and spend a few minutes visiting while the kids run around and chase each other and get their energy out before we go home. Those few minutes are an easy way to connect. We need family friends, and we’re starting on the long road of cultivating long-term, local friendships. I know it’s possible that we’ll move in the coming years, and more likely that the friends we make now will also move, but it’s worth trying and making the effort. When I was in high school, my friends and I were more likely to stay out of “compromising situations” if our parents would chat with each other. That created accountability. I got into significantly more trouble with my friends from families my parents didn’t know. My husband grew up in a small town that had only a handful of minimum-wage jobs. If you wanted to get one of those sought-after jobs, you had to be known as a hard worker. Your reputation was critical. There were no restaurants or retail stores who only knew you from your one-page application. Everyone knew if you worked hard or not because they had watched you grow up in that small town for your whole life. It was accountability. While I’m pleased about the idea of having a network to keep our kids accountable, I am even more excited about the potential of having a network for support for these kids and for the grownups. I want them to be really comfortable at my house. I want them to drop by unexpectedly and eat all my snacks. I want my home to be a safe place where they can really talk, and they can call us if they need us. So that’s my plan. I’m working on making it happen. Have you done this? Did it work out as you hoped? I wonder if I’m being hopefully optimistic, but I still think it can work. Your post really resonates with me. We moved a year and a half ago, and have been trying to cultivate friendships ever since. Our children aren’t yet school age and we’re struggling to find parents with similar interests to ours. I’m hoping someone can comment with ideas And experience in doing this. I really want this for my kids and myself and husband too. We moved to a new city 5 yrs ago and our first son is almost 2 yrs old (second one on the way). I haven’t built a network of friends yet, but I strongly desire one. I have tried some Meetup groups but not found our niche. We are friends with one neighbor but our neighborhood is mostly single people w/out kids. Have thought about joining the UU church…?